Mark Barron will certainly be a believer of the popular quote that says “Every disappointment is a blessing”. This is because the American football player went from being the starting strong safety player for the Tampa Bay Buccaneers to playing back up and later out of his preferred position, for the St. Louis Rams after he was unexpectedly traded. The 2012 PFWA All-Rookie Team member has since gone ahead to make the best of it and is now set to appear for the Rams at Super Bowl LIII where he hopes to become a champion. Mark Barron was born on the 27th of October, 1989, in Mobile, Alabama. Details about his parents and early life are not known, however, it is said that the young boy exhibited excellent athletic ability that prompted many people around him to take note. When the time came for Barron to attend high school, he enrolled at St. Paul Episcopal School where he put his athletic talents on display as he played high school football and competed for the school’s track & field team. In track & field, Barron won multiple 5A individual state titles in different events. On the football side, he showed his versatility by playing multiple positions, including running back, wide receiver, and linebacker. In his junior high school year, he recorded 785 rushing yards on 78 carries and added 368 receiving yards on 23 catches, with 12 touchdowns. In his senior year, Barron managed 1,094 rushing yards on 122 carries with 15 touchdowns. His performances at the 2007 Class 5A state championship game earned him the MVP title as he was also named a first-team Alabama Sports Writers Association All-State selection. After graduating from high school, Mark Barron was ranked as a five-star prospect. This meant he was sort after by some of the most prestigious college programs in the United States. The Alabama native, however, chose to stay close to home by accepting to play for the Crimson Tide football team of the University of Alabama. Barron did not manage to start a game in his freshman year but he however featured in all of his team’s 14 games, recording 18 tackles, and a sack. In his sophomore year, Barron became a starter on the team that went on to win the national championship. He contributed with 74 tackles, 7 interceptions, and 1 touchdown, and was subsequently named first-team All-SEC selection. Barron went on to play for two more years at Alabama, earning two more first-team All-SEC selections and two first-team All-American selections, one of which was unanimous, as well as a second BCS national championship before enlisting for the 2012 NFL Draft. 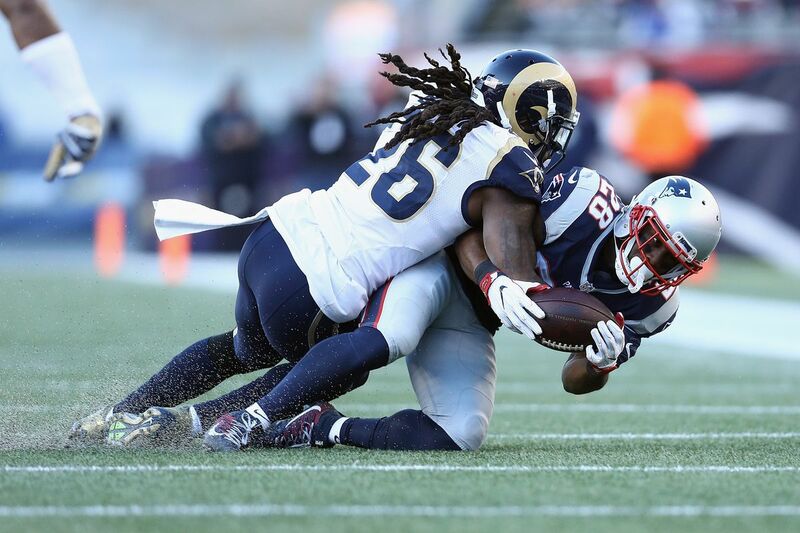 Prior to the 2012 NFL Draft, Mark Barron underwent a sports hernia surgery. This meant he was not able to perform drills at the NFL Combine in Indianapolis even though he attended. About a month later, at the Alabama Pro Day, Barron, who had now fully recovered, performed a majority of drills in front of numerous NFL scouts. He was said to have impressed a number of people who considered him to be the best safety prospect ahead of the draft. The Tampa Bay Buccaneers was one of the teams impressed with his ability as they used their seventh overall pick to gain his services. After accepting a four-year deal worth $14.56 million, Barron went ahead to have a stellar rookie season that earned him a place on the Pro Football Writers Association All-Rookie team. He played in all 16 games that season and managed 71 solo tackles, 17 assisted tackles, 10 pass deflections, 1 interception, and 1 forced fumble. Halfway through his third season with the Buccaneers, Mark Barron was traded unexpectedly to the St. Louis Rams. In his new team, he had to settle for a back up Strong Safety position behind veteran T. J. McDonald. During the course of the 2015 season, following an injury to the team’s weakside linebacker, Barron got his first career start in that position and has since featured as the Rams’ hybrid weakside linebacker. As expected for someone who originally played as a strong safety but now plays as a linebacker, Mark Barron has a height of 6 feet 2 inches (1.88 m) and is said to weigh about 230 lb (104 kg). His other body measurements, as listed at the Alabama Pro Day, are Arm Length – 33 5⁄8 inches (0.85 m), and Hand Size – 9 1⁄2 inches (0.24 m).